Yara Ramos is a veteran teacher from Camuy, Puerto Rico. She arrived in Orlando with her four children, still ambivalent about her career. And now a story about starting over in a new place. There are a lot of new students and teachers in Orlando's public schools this year. That is because after Hurricane Maria, many Puerto Ricans came to that city, which is home to a third of Florida's Puerto Rican population. 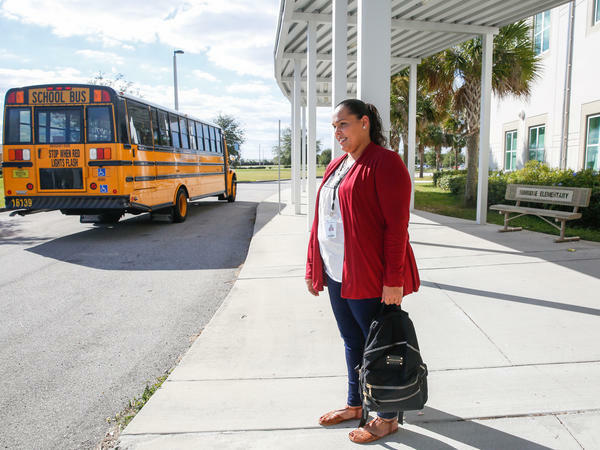 NPR's Claudio Sanchez visited some teachers who are settling into new roles in Orlando and finding that it's not so easy. CLAUDIO SANCHEZ, BYLINE: Nearly 2,000 new students have enrolled in schools here, and they need teachers. So the Orlando Public Schools have hired classroom teachers and paraprofessionals as well as bus drivers from Puerto Rico. But because so much of the island is still in the dark, recent arrivals still cannot retrieve copies of their teaching credentials, proof of employment or transcripts from where they earned their teaching degree. BARBARA JENKINS: That might mean they start out as a substitute teacher until we can find those credentials or gather what the state would require for their license. SANCHEZ: That's superintendent Dr. Barbara Jenkins. JENKINS: But we'll be very creative in hiring them as teacher assistants or substitute teachers in the interim. In fact, we have quite a few that are in the process now of coming to work for us. SANCHEZ: Yara Ramos, a veteran teacher from Camuy, Puerto Rico, arrived in Orlando with her four children still ambivalent about her career. YARA RAMOS: I'm a strong person, but it's been really hard because I had no needs before Maria. You know? SANCHEZ: Despite teaching for 10 years, she's starting over again as a paraprofessional. The full-time job, though, means that she can now move out of her brother's house where she's been living for more than a month, and she can start putting her life back together again. She says her home, her students and her colleagues are never far from her mind. RAMOS: I miss my people. They've been my co-workers for over 10 years. You know, it's family, too. My classroom, it's probably there the way I left it, you know, with everything packed in bags. All my computers were sealed. And I'm not coming back. SANCHEZ: Yara is waiting for relatives back home in Camuy to send her the documents she'll need to be hired as a licensed classroom teacher. Like many teachers who left Puerto Rico after Hurricane Maria, Yara applied for a job at the airport the day she arrived. SANCHEZ: Next to empty ticket counters, the school district has set up dozens of tables end to end in what was once a vacant terminal. UNIDENTIFIED WOMAN #2: Felix Vasquez. SANCHEZ: A woman with a clipboard reads the names of people waiting to be interviewed. BRIDGET WILLIAMS: We're looking for teachers, we're looking for managers, we're looking for bus drivers. SANCHEZ: Bridget Williams is the school district's chief of staff. She's overseeing the operation here. She says the message for the most recent arrivals is the same as it was a month ago, when Yara arrived. WILLIAMS: I talked with a number of those coming in that have a Ph.D. in chemistry, a Ph.D. in physics, and they realize they're going to have to go through this process, and that's hard. That's hard. SANCHEZ: And it could get harder. School officials here say they're bracing themselves for a second and third wave of teachers from Puerto Rico looking for jobs. Claudio Sanchez, NPR News. Transcript provided by NPR, Copyright NPR.